Here's what happened in October to Teekay Corp., affiliate Teekay Tankers Ltd., and offshore drillers Noble Corp. and Ensco PLC. 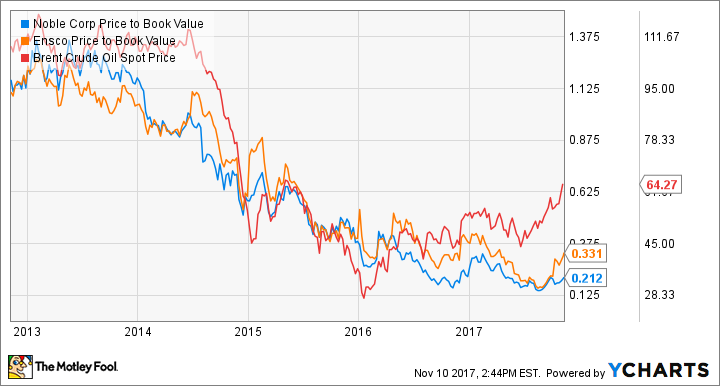 Shares of Teekay Corporation (NYSE:TK), Teekay Tankers Ltd. (NYSE:TNK), Noble Corporation (NYSE:NE), and Ensco PLC (NYSE:ESV) finished last month down between 8.6% and 9.7% from where they started. Furthermore, they were all down between 9.6% and 13.5% from their peaks in October. In other words, if you bought shares of any of these stocks near their highs in October, you've probably lost money so far. So what gives? The interesting thing is that there really wasn't any material news about any of these four companies reported in October. Since oil prices started falling in mid-2016, it's been increasingly more difficult for companies that operate in the offshore oil and gas patch. For drillers Ensco and Noble Corp. and their competitors, it's been especially hard. When the downturn really kicked in during 2015, offshore-oilfield owners began slashing spending for development of new wells. This has caused a massive amount of disruption in the driller segment, with several major companies filing bankruptcy, almost every other company idling its off-contract vessels to lower expenses, and a huge swath of the oldest drilling vessels being scrapped over the past two years. It has also led to consolidation, such as Ensco's acquisition of Atwood Oceanics, which closed in early October. Noble Corp. added $800 million to its backlog in the third quarter, which it announced in early November. The company has managed to keep its backlog of $3.2 billion essentially flat this year, a notable achievement as many other drillers' backlogs have gotten smaller over the course of the year. The company has also managed to generate positive cash flows this year, while its competitors have had to dip into cash reserves and debt to fund operations. NE Price to Book Value data by YCharts. Teekay and Teekay Tankers are driven by slightly different dynamics, since their business is more about total demand for the transportation and storage of hydrocarbons around the globe. While there are some potential growth drivers, part of the challenge will be the industry working through an oversupply of vessels in certain segments. Another will be Teekay's ability to take advantage of growth in others, such as vessels that can offtake, process, and transport oil and natural gas produced in remote offshore locations. Between the two segments, I think there's more potential upside to be unlocked in offshore drilling. It remains one of the most beaten-down segments of the energy industry, and it's possible that it won't fully recover for another year or more. And the advent of low-cost, fast-turnaround onshore shale has decreased the need for offshore spending over the past two years.